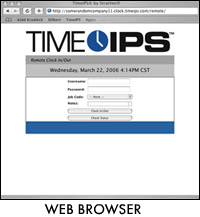 TimeIPS is a continuously developing software package. New features and optional modules are available for TimeIPS customers on a regular basis. Using the left pane Main Menu, click on: Administration » System Administration » Modules. The Unlimited Jobs module provides an unlimited number of active jobs, job customers, and job categories as well as work-order tracking. This powerful upgrade module provides the ability to create work orders. Each work order can contain one or more jobs, with specific details for what needs to be done on each job. This is ideal for businesses involved in production, assembly, fabrication or service type work where multiple jobs with specific instructions are required for each customer project and the time on each set of jobs needs to be tracked under a single work order number. At the end of each day, week or any period you desire, TimeIPS will provide you the hours and minutes worked on each job within each work order. Each work order can have a Customer, Name, Code, Start Date, Due Date and PO number set. A bar-coded PDF page can be generated and printed for each work order. This can be used by employees to clock into the work order so that the jobs on the work order can be tracked. Must be used with IPSIPS (provides 30 jobs). If you have more than 30 jobs, also purchase IPSJOB. Round time up or down to the specified minutes. Snap work start or end times to a specific time based on clock in/out time range. Automatically deduct break or lunch time based on hours worked in day. The Remote Employee Clocking feature allows up to 10 employees to clock in and out from a computer terminal networked with your TimeIPS time station. Create or upload a security certificate for secure TimeIPS web pages. Encrypt all communications between master and client(s). The Enhanced Payroll Integration module supports many additional payroll exports. Please view our secure.timeips.com description for the complete list. The Custom Payroll Export module allows for payroll exports with completely customizable formatting. Employees Request Benefit Use, Managers Can Approve or Deny. Employees see a Benefits Request option under MyTimeIPS. Benefit use can be requested. Managers see requests and can approve or deny. Email reminders and numerous configuration options. Employees and Managers Approve Timecards for Payroll. Employees see a Timecard Approval option under MyTimeIPS. Worked time can be reviewed on a calendar and approved. Managers see approved and pending timecards. Payroll checks for all approved timecards before running. Email reminders and numerous configuration options. 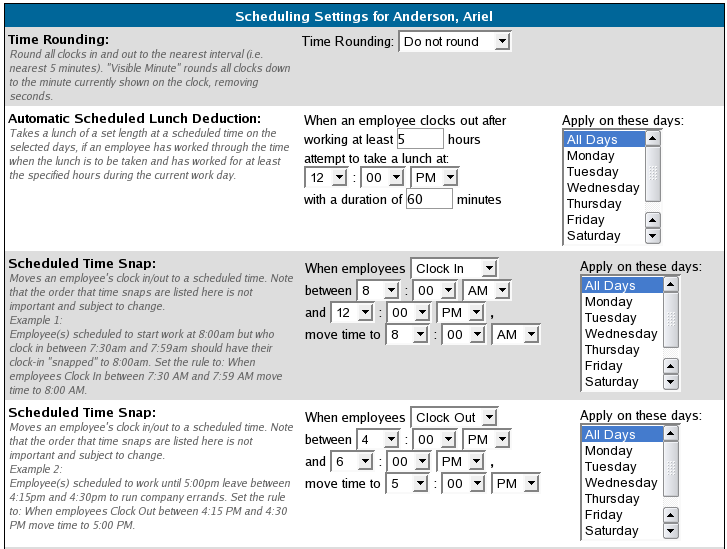 Set Daily Overtime and Doubletime Options: For each day of the week, set the number of hours worked before Overtime or Doubletime goes into effect. his allows for rules such as any work on Sunday is paid at Doubletime, or work after 4 hours on Friday is Overtime. Additional Overtime Level for Premium Time: Additional overtime level for Premium Time. This allows for Doubletime-and-a-half, or other user-defined pay multiplier level as needed. Holiday Time can be Overtime or Doubletime: Set work done on a Holiday to be either Standard Time, Overtime, or Doubletime. Activate a device such as a buzzer or door lock at a specified time or triggered by an employee clock in/out using a TimeIPS Relay Control.